The Seattle Seahawks have been one of the best teams in the NFL over the last four seasons. They are known for a dominant defense and a physical running game. This year, that formula changed a bit with the loss of running back Marshawn Lynch for half the season due to nagging injuries and sports hernia surgery. 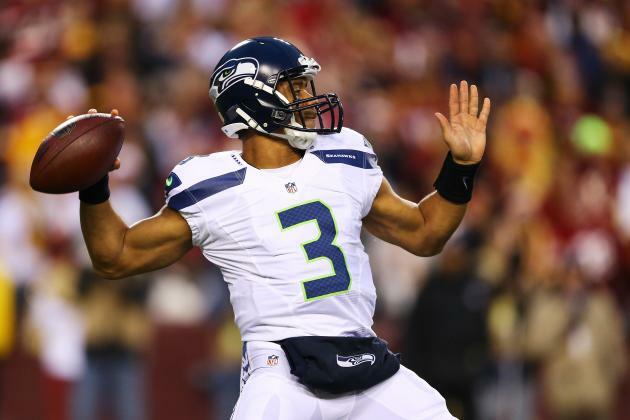 The responsibility of the offense fell more on quarterback Russell Wilson to run the show and make it happen. The offense was still successful, but there was no doubt that they could have been even better with a healthy Marshawn Lynch. The veteran running back has been the staple of their offense since their run started in the Great Northwest. Each game, you got used to seeing a physical run happen that would just amaze you. Many players said he was one of the toughest players to tackle in the NFL. But Marshawn has decided he has had enough of the NFL. At the age of 29, Lynch has decided to call it a career. Lynch tweeted out a picture during the Super Bowl that indicated that he was retiring and there were messages from teammates Russell Wilson and Richard Sherman along with Seahawks owner Paul Allen that all but confirmed it. The real confirmation came when Lynch’s agent confirmed it on Monday that Lynch was indeed calling it a career. So Beast Mode will now be leaving the game and headed on to a new chapter of his life. Many will remember the things that he did on the field and the effect he had there on the Seattle team. One of the most memorable plays of his career had to be the run he had against the New Orleans Saints back in 2011. That run and the cheers led to an actual earthquake happening. And that memory will forever be in the minds of Seattle fans and NFL fans as well. But what will also be in the memory of many is that Marshawn did things his own way. Much was made of him and speaking to the media. When he was in Seattle, media was not something he did at all. If he could have his way, he would avoid it at all costs. But due to threats of being fined, he eventually made some appearances with media. Those appearances, however, were still done on his own terms. He said very little if anything and promptly told media why he was really there. Who can forget him saying that he was at the Super Bowl press conference last year so he does not get fined? 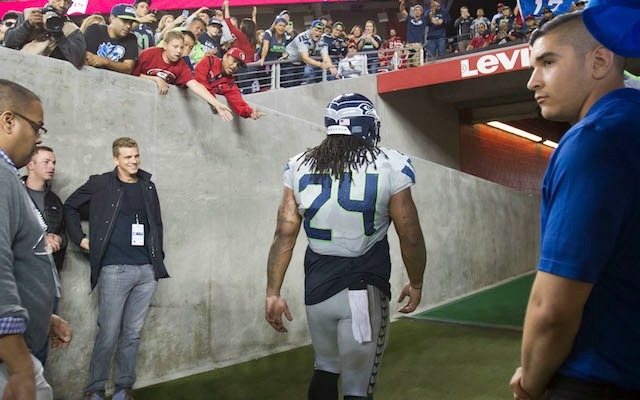 Marshawn just was not about the media at all and could care less about talking to them. He was more about playing the game and having fun with his teammates on the field or as he says it “I’m bout that action boss.” And about the action he was with career numbers of 9,112 yards, a 4.3 career average per carry and 83 career touchdowns over nine NFL seasons. Marshawn Lynch and his exploits on the field will be talked about for a while. And there will be a debate whether he is worthy enough to make the Hall Of Fame in the upcoming years. He put up some good numbers over nine years. But the reality is he has 3,000 less yards than Frank Gore and he also has 29 less career touchdowns than Adrian Peterson. Both Gore and Peterson will more than likely be Hall of Famers. But with the way he handled media, that could affect him getting in. Lynch, though, could probably care less whether he makes the Hall of Fame or not. To him, he got what he wanted out of the NFL and is now able to move to the next step of his life. And reportedly, he has not spent much of his money he made in the NFLl. Lynch can now devote his energy to causes that affect where he is from, Oakland, and things that interest him and create a new life and identity for himself away from the game. And more importantly, Lynch can now be as quiet as he wants to be. Of course he cannot live like a hermit because many know who he is. But he can get away from the spotlight that he really did not like anyway. And that seems to suit him just fine. Lynch definitely was a guy that struck fear in defenses. And when Seattle began to become the power they are now, he was the face of that movement. But Lynch has made his decision and it is time for him to move on. And who can blame him? He is getting out with his health and a bunch of money to live with. And he more importantly got to go out the way he wanted to go out: on his own terms. Good luch in retirement Marshawn. Enjoy life after football. 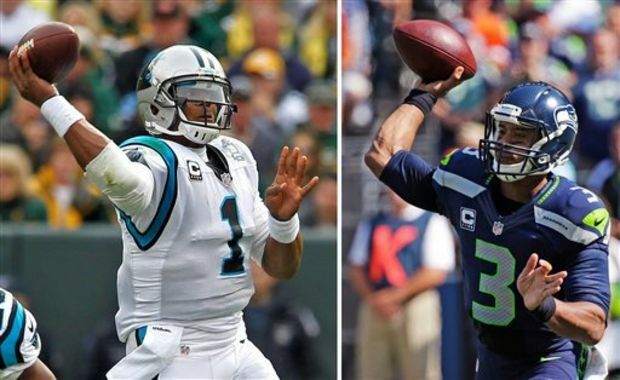 The matchup between the Seattle Seahawks and the Carolina Panthers was billed as one of the best of this past weekend. Both teams have physical defenses, run the football well and have dynamic quarterbacks. But only one of them could survive this weekend. Many were split on who would win this game. There were some that felt the Seahawks would get it done because of their experience and the way their offense can explode at any time. And there were others that felt the Panthers would win due to being at home, defense and the great play of quarterback Cam Newton. Well, it was a story of two halves in Charlotte Sunday as both teams showed us what they were made of. Carolina got off to a great start to the game and led 31-0 going into halftime. But the Seahawks came roaring back in the second half, getting as close as 31-24 with just a little over a minute left in the game. But in the end, the Seahawks just ran out of time and could not overcome the big lead Carolina got out to. And with that, the Carolina Panthers are in the conference championship and will be hosting the Arizona Cardinals next Sunday night. But the Panthers almost lost this one. Playing conservatively the second half almost cost them. So in moving forward, they must remember what they did to build the lead against the Seahawks going into next week. The Panthers have a scary defense. Linebackers Luke Kuechly and Thomas Davis are the best tandem of linebackers in the NFL. But the key to this defense is definitely their front four. They were everywhere in the first half of the game. And the pressure they created helped the defense collect two interceptions, with Kuechly returning the first interception for a touchdown. Along with putting pressure on the quarterback, the Panthers defensive line also was able to get penetration against Seattle to stop the run in the first half. But in the second half, it seemed like their foot off the gas. With either the coaches getting conservative or the players getting tired, the pressure seemed to ease up on Seattle quarterback Russell Wilson. As a result, the Wilson started attacking the Carolina secondary relentlessly. In the second half, Wilson was able to get matchups that favored his wide receivers and mostly avoided Panthers cornerback Josh Norman (the last Seattle touchdown went to Jermaine Kearse as Josh Norman whiffed on knocking the pass down). The Panthers were still able to keep Seattle running back Marshawn Lynch under wraps, but Wilson began to figure the Carolina defense out. If the Carolina Panthers want to win next week in Arizona, they have to keep up the pressure. Of course they will probably mix up their blitzes more next week. But in this game, cornerbacks Cortland Finnegan and Robert McClain had some troubles because they relaxed a little as a unit. And if both Finnegan and McClain had some trouble in this game, then they will surely have trouble against the number one offense in the NFL and especially the wide receiver trio of John Brown, Michael Floyd and Larry Fitzgerald. But the issues the Panthers had in the second half did not only stem from their defense. The Panthers came out aggressive offensively in the first half. The tone was set for Carolina when running back Jonathan Stewart ran for 59 yards on the opening play. 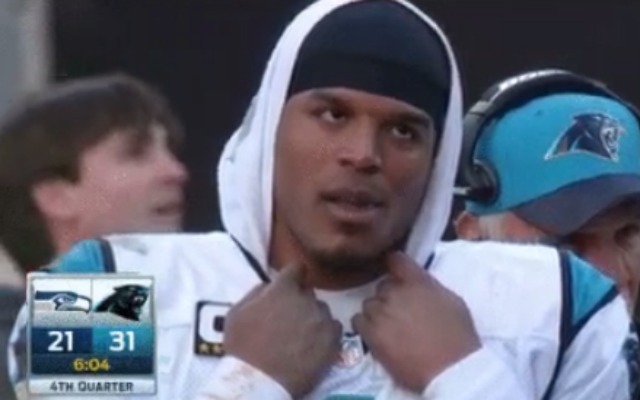 The Panthers were running right at the Seahawks and there was nothing Seattle could do about it at all. And along with the running game working, Cam and the passing game were making plays as well. Cam’s passing was particularly solid in the first half of the game on third downs, going 3/4 on third-down throws. But in the second half, it seemed like all that aggression the Panthers had offensively had gone away. The Seahawks began to recognize the Panthers were playing conservatively and would not really take any chances on their defense. Cam completed two more third down conversions through the air for the game, but it seemed like the offense was struggling to the finish line. If they are to play like that against Arizona, then there will be some issues. Getting a lead on the Cardinals will not be enough because they are more explosive than the Seattle offense and have more weapons than them too. If Carolina is to win next week and advance to the Super Bowl, they have to keep their offensive aggression. That second half performance will not get it done. Cam Newton and many of his teammates are in the conference championship game for the first time. And if they can take anything away from their game against the Seahawks, it’s that they must smell blood in the water. When you have a team down, you have to finish them off right then and there. If not, situations like Sunday can occur. The ante has now been upped and the competition is tougher. Can the Panthers respond to the challenge or was the regular season where their championship resided? For more sports talk, feel free to follow me Twitter or check me out on Facebook. The Minnesota Vikings had the perfect opportunity to knock off the defending NFC champions, the Seattle Seahawks. It was an extremely cold day in Minneapolis, reaching sub-zero temperatures. The Seahawks were again going to be without their leading running back, Marshawn Lynch. And the perception was the Seahawks were not quite as strong as they once were. To win a game like that against a defending champion, you have to come out and play strong, make no mistakes and capitalize on any and all opportunities. The Vikings came out and played the Seahawks tough. They matched the Seahawks’ physicality in the trenches, played their wide receivers pretty well and limited the mistakes against them. But unfortunately, the kick they had to win the game sailed wide left and the Seahawks will be marching on to face the Carolina Panthers in Charlotte next Sunday. 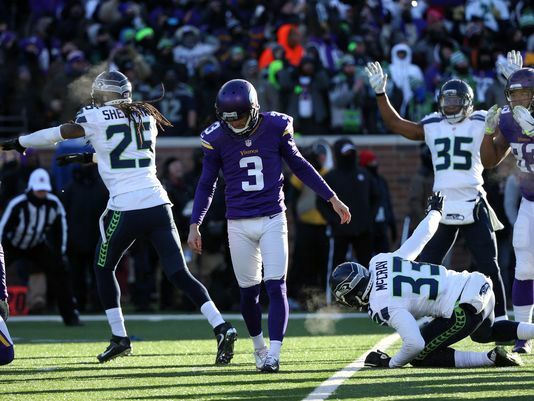 Many have thrown the blame at the feet of kicker Blair Walsh. But there were a few plays that cost the Minnesota Vikings that game. And no, one of them is not the last play of the game. It was a case of Minnesota not taking advantage of their opportunities. In the first half, the Seattle Seahawks had an issue receiving a punt. Punter Jon Ryan picked up a botched snap and tried to run for it. Unfortunately he did not make it and gave the Vikings the football in Seahawk territory in the first quarter. To beat a team like Seattle, you have to capitalize on those type of plays. But instead of making it happen after that turnover on downs, the Vikings could not get the ball in the endzone and they had to settle for a Blair Walsh field goal. If they were able to score a touchdown on that short field, they would have been able to gain momentum and also make things hard on Seattle. With the way the Vikings were playing defensively, it would have put a ton of pressure on the Seahawks with that score. But instead of doing so, the Vikings stalled and had to settle for three points. Whether or not they would have made the extra point is irrelevant there. But even if they score that one touchdown there instead of the field goal, that would have given the Vikings twelve points instead of nine total points for the game. At that point, pressure would have been on the Seattle to score two touchdowns against a stingy defense that was giving Russell Wilson fits. Another momentum turn the Vikings missed was in the fourth quarter. Russell Wilson and the Seahawks were driving down the field, trying to scratch their way back into a 9-0 game in the Vikings favor. It was 1st and 10 for the Seahawks at the Vikings 39 when the snap went right past Russell Wilson. He turn and ran to get the football, got control of it while getting back on his feet, scrambled to his right, away from oncoming Vikings defenders and found a wide open Tyler Lockett in the middle of the field. Lockett caught the pass and took it all the way down to the Vikings four yard line. And from there, the Seahawks would score on a touchdown pass from Wilson to wide receiver Doug Baldwin to bring them within two points of the Vikings after the extra point. Looking again at the play, the Vikings missed an opportunity to make a big play themselves. Vikings defensive back Captain Munnerlyn was within striking distance when Russell Wilson made that great play. But instead of running at him under control, Munnerlyn came out of control at Wilson and he escaped right around him. If he comes under control, the Vikings get the sack and the Seahawks are in a deep hole. But instead of that, Wilson makes them pay for not doing what they were supposed to be doing. Despite all that had happened not in their favor, the Vikings still had the upper hand and the lead. But after that possession where Russell Wilson broke their hearts, Adrian Peterson made a crucial mistake. The Vikings needed a big possession to stem the momentum Seattle had after their touchdown. They started off well, gaining five yards on first down. But then on the next play, Teddy Bridgewater threw the football to Adrian Peterson out of the backfield. Peterson got the first down, but unfortunately he did not put the football away. Peterson has had fumble issues over his entire career and they snuck up on him at the wrong time. Seattle safety Cam Chancellor ripped the football from Peterson and the Seahawks recovered the ball. Seattle would take the turnover and turn it into three points, as they were able to get a field goal from Steven Hauschka. From there, the Vikings just could not get it going until the last drive of the game, which resulted in the missed field goal. And just like that, the Vikings squandered their home-field advantage they worked hard for this year. Their season was officially over. The Vikings are a talented team. And they played the Seahawks tough the entire game. But when you are to beat a champion, you have to limit the mistakes and capitalize on the opportunities. The Vikings were not able to do so and that ultimately ended up in their undoing. Blair Walsh has to make that kick to win the game, but it should not have to come down to that. The Vikings learned a lesson Sunday and unfortunately it was a painful one. The Seahawks are the NFC champions for a reason and they Vikings were not ready to take the next step.